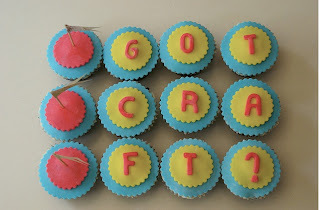 Got Craft Blog: got craft :: spring 2011 vendors! It's that time of year again! The Got Craft Spring show is coming up on Sunday, May 8th, 2011 at the Royal Canadian Legion on Commercial Drive from 10:00am to 5:00pm. We'll be celebrating our 5th birthday, so make sure to join the festivities with our amazing vendors listed below. Lots of newbies to the show, so there will be tons to check out! Too hungry to shop? Bake Sale Baking Co. and The Gluten Free Epicurean will be serving up baked treats while Varinicey will be outside cooking up some veggie pakoras! Spool of Thread Sewing Lounge will show you how to make a take away craft project and stop by the Maker Faire booth for details on their upcoming event in June! Of course, for those early birds, the first 45 people through the door will receive a coveted Got Craft swag bag. Have you seen the goodies inside? Check out some past samples here, here and here. A Cagey Bee, Sassy Contessa, Smuttons by Kimli, The Beautiful Project, Abeego Designs, Barefoot Contessa, Bake Sale Baking Co., Banoo, Billy Would Designs, Frankenstrap, cabin + cub, Cynthia F., district Thirty designs, Divesin, Sam Made, eikcam, GLOBE Foundation, gypsee designs, heyday design, hudsonny, Laura Bucci Handmade, Mena Dragonfly, Olive Bath and Body, smidgebox designs, Stitchella, Twig Prints, The Gluten Free Epicurean, The Rice Babies, Little Bird Designs, BuenoStyle, Inspryed Creations, irit sorokin designs, Faire by KeikoCreative, Its Your Life Handmade, LynnDee Designs, AstridLily Designs, kukubee, pomo mama design, GroovyGlassGirl, Superfly Lullabies, Bubbly Shnooks, Comiditas, kove handmade, Earthgirl Aromatherapy, Firefly Notes, honey canada, Raven's Rest Studio, Hello Bobbie, Roxypop, Telly Designs and Robbie Vergara Screenprinting.